Every headstone memorial in Hounslow will be tested to ensure it is safely erected and could not fall and cause injury. In recent years, the instability of some memorials in parts of Britain has caused a number of accidents, some fatal, to members of the public. The Health and Safety Executive has ordered all local authorities to devise an inspection programme for memorials and remove any risk identified. 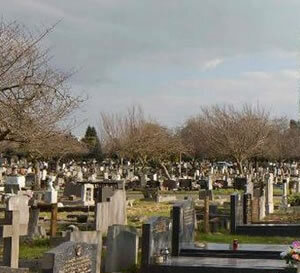 Testing of nearly 30,000 headstones at nine cemeteries and four churchyards in Hounslow will begin in March and is expected to be completed by the summer of 2006. Cllr Amrit Mann, executive member for promoting community cohesion and community safety, said "While this is a very sensitive issue, this is work we have a legal duty to perform and we hope residents will co-operate with us. "There have been accidents in some parts of Britain where headstones have fallen and injured members of the public. This is obviously something we are keen to prevent." The testing procedure that will be used has been devised by the National Association of Memorial Masons (NAMM) and approved by the Institute of Cemetery and Crematorium Management (ICMM). Inspectors trained to NAMM standard will carry out an examination, which involves a visual and physical assessment of each headstone, and results recorded in a computer database. Once a headstone has been tested, it will be placed in one of four categories. This will determine whether any repair work is necessary to make it safe. If work is required, owners of burial rights will be informed via letter, if possible, but in cases where there is no forwarding address or where the owner is deceased, a notice will be placed on the memorial giving details and time of action. When writing to inform families, the Council will advise them to contact NAMM-approved stonemason companies to carry out any necessary repair work.